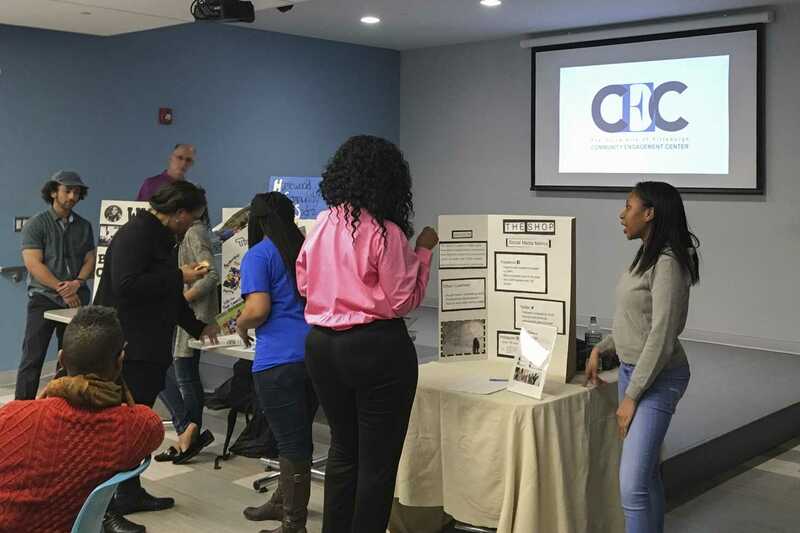 Students, Homewood residents and members of the Community Engagement Center filled the Homewood-Brushton Branch YMCA’s meeting room, waiting for their chance to hear how the community workers had been spending their time. Residents of Homewood attended the Pitt CEC’s Community Assistant Report Out event at the YMCA at 6 p.m. Monday night. The event showcased the projects 10 participating students have been working on. Students involved with the project, called community assistants, have been working with community organizations as volunteers and assistants since fall of 2017. Kathy Humphrey, senior vice chancellor for engagement, started the Pitt CEC program this spring — an initiative with the intention of strengthening the ties between the University and surrounding communities within Pittsburgh. The Homewood branch of the CEC will encompass two buildings within the neighborhood, which will provide a space for University-sponsored programming such as community meeting spaces, training sessions and medical and counseling services. Daren Ellerbee, director of the Homewood branch, is a Pitt alumna who joined the project in July 2017 after working for the Urban Redevelopment Authority of Pittsburgh. “I worked with a lot of a lot people, a lot of community leaders in Homewood already, so it was a really nice transition for me … I’m a nice hybrid of all of these different entities,” Ellerbee said. The Homewood branch is the first to open, and over time up to five centers will be built in to-be-determined neighborhoods around the City. She said Homewood’s is set to open in September, with a location in the Hill District set to open in early 2019. “I think what we want to do is make sure we’re not stretching ourselves thin and make sure that we get it right in Homewood and the Hill District,” Ellerbee said. According to Ellerbee, the University has been involved in social research within Homewood since the early ’90s. She said social work students who have worked in Homewood are part of the reason why Pitt has come to Homewood. “It just made sense for us, given those partnerships that we already had, to make our first center in a place that we have such a presence,” Ellerbee said. The program is continuing to build these relationships through its community assistants. To become a community assistant, students had to apply for the position in the summer of 2017, after which they were placed within an organization within Homewood. Earl Goldsborough, a sophomore ecology and evolution student, volunteered at the Afro American Music Institute — an organization co-founded by James Johnson, Jr., a music professor at Pitt. Elizabeth Steiner, a sophomore social work and sociology major, worked with Homewood’s Community Development Collaborative, the CEC administration and Building United — an organization focused on increasing home ownership within Homewood. Steiner did research for Building United, compiling a document containing the details for more than 800 parcels of land within Homewood, including tax status, code and use. “We were trying to look at how many properties are publicly owned in homewood, how many were residential versus commercial and what their uses were,” Steiner said. Steiner’s biggest project was a repository of research consisting of community and outside organization documents and research. She said a lot of the research at Pitt is then utilized by the community partners in Homewood. “That’s what the CEC is all about — is strengthening the partnership between Pitt and the Homewood community,” Steiner said. Jalen Bryant, a sophomore chemical engineering major, volunteered for the Maker’s Clubhouse at the Bible Center Church in Homewood for 14-20 hours a week. He put together a program to teach third- through fifth-grade students robotics and logic. Over the course of the semester, Bryant increased the complexity of the program. He eventually began teaching them basic physics and engineering concepts. Cheri Smith, a Homewood resident and member of the CEC Advisory Board, became involved with the project last year after becoming aware of it through social media. The board consists mostly of Homewood residents, business owners and people who have a vested interest in the community. Smith believes that once the CEC is fully operational, it will have a positive impact on the community and people will be extremely supportive.